Do you have an Instant Pot? It’s the hottest thing in cooking (pun intended) right now. It’s not necessarily a new way to cook since pressure cooking has been around for ages but this new style of pressure cooking with an electric pot is such a time saver. People are obsessed with their Instant Pots and I’d have to say, I LOVE mine as well. Meats like roasts and ribs are amazing in it. I also use mine for making soups, browning ground beef, boiling eggs, reheating frozen foods, like soups or casseroles. 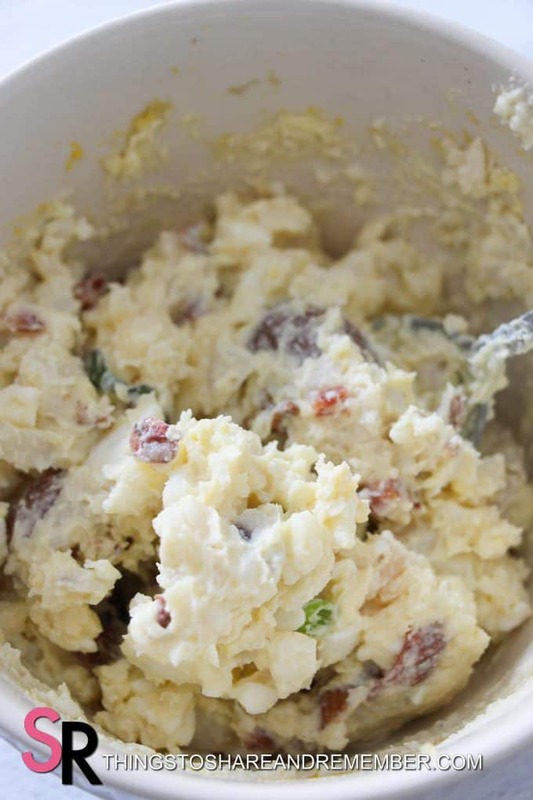 Try making Quick & Easy Instant Pot Potato Salad in your Instant Pot. It saves time and cleans up quick with using your one pot for cooking. 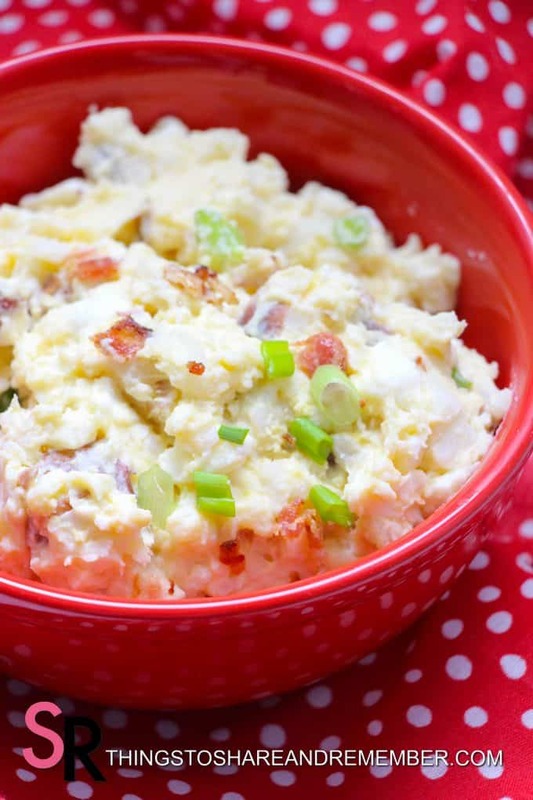 There’s actually several ways to cook the ingredients in your Instant Pot for potato salad. You can follow the beginner method, like shown here, cooking your eggs and potatoes separately. 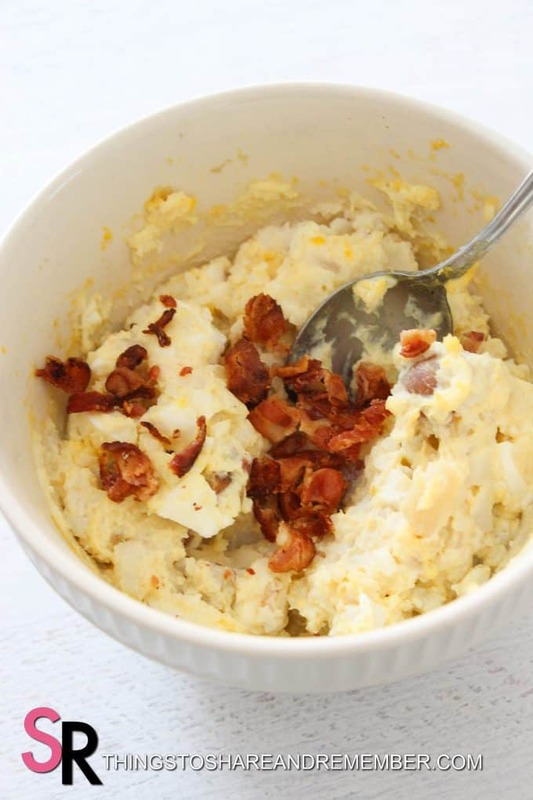 Consider trying This Old Gal’s method of cooking your eggs right on top of your potatoes! 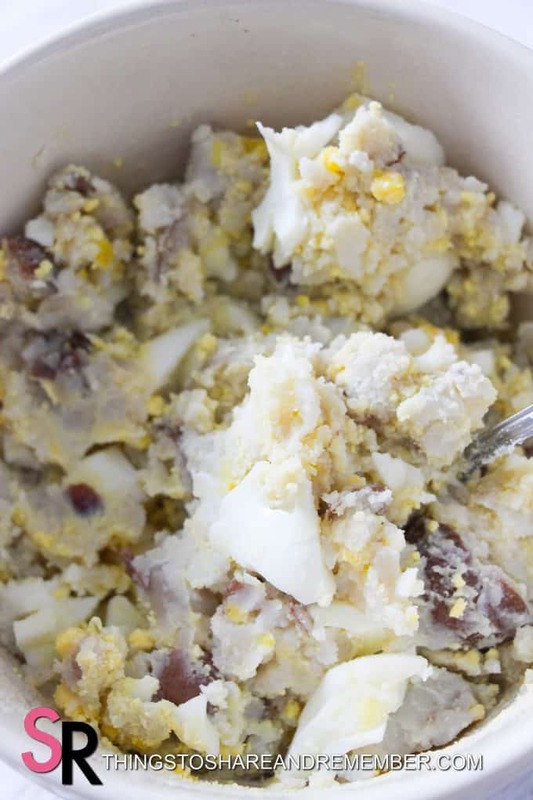 Another method shared in the Instant Pot® Community on Facebook, is to make an “egg loaf” in your Instant Pot. It involves cracking the eggs into the bottom of the Instant Pot and cooking them in a big chunk, or loaf. Then you chop it up for putting into the salad. It saves time because you don’t have to peel all the eggs. You’re going to chop up all the eggs anyway. Genius! Otherwise, follow the directions below. Hard boil your eggs either in a saucepan or the instant pot. (To prepare in the instant pot, see note.) Chop the potatoes into 1″ chunks. Place the potatoes in the IP and cover with water. 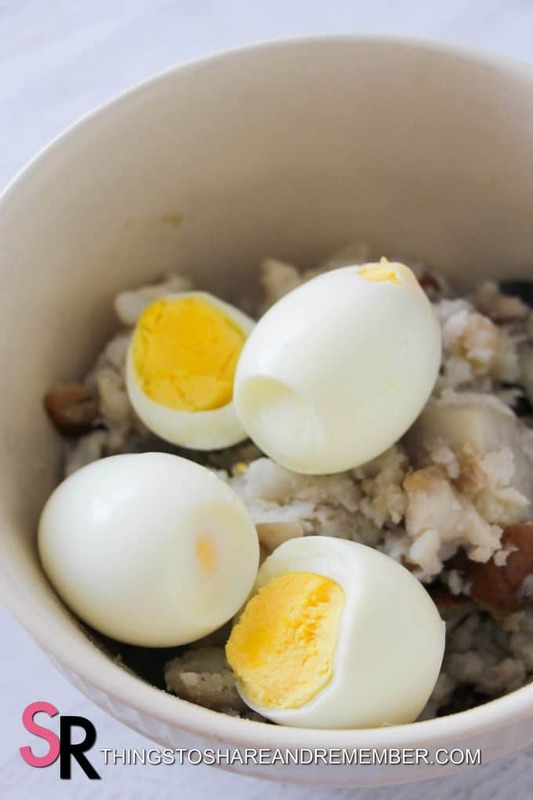 NOTE: Place 1 cup of water and in your instant pot and carefully add in the eggs. Select manual setting and reduce time to 8 minutes. Quick release. Place the eggs in the fridge until cool slightly for easiest shell removal. Place the lid on the IP and seal. Set to manual for 5 minutes. Quick release. Drain the potatoes using a colander and then place in a medium-sized bowl. Chop up the eggs and mash into the potatoes. Chop the celery and onion and add into the potatoes-egg mixture, then the remaining ingredients and mash together using a fork or an electric mixer until you achieve the texture that you prefer. 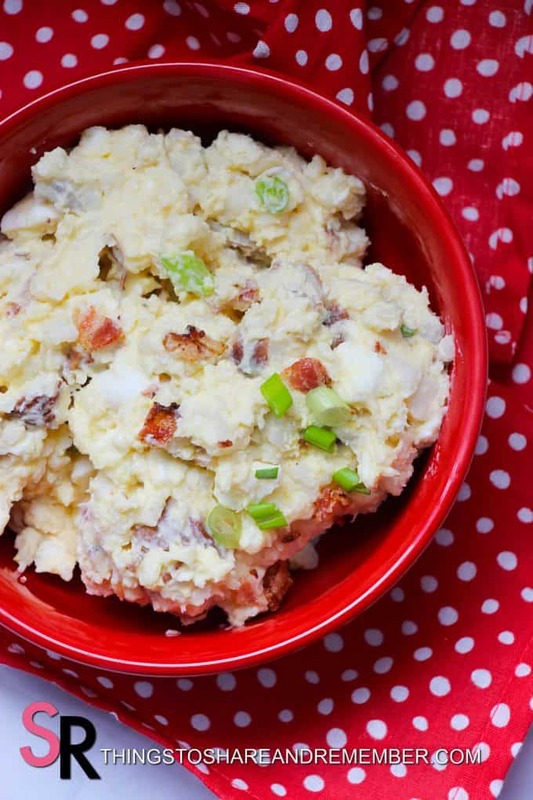 Bacon and chives add the flavor that makes the potato salad. Our favorite bacon is Nueske’s bacon. Yum! Perfect summer side dish. Not sure if you’d like an Instant Pot? 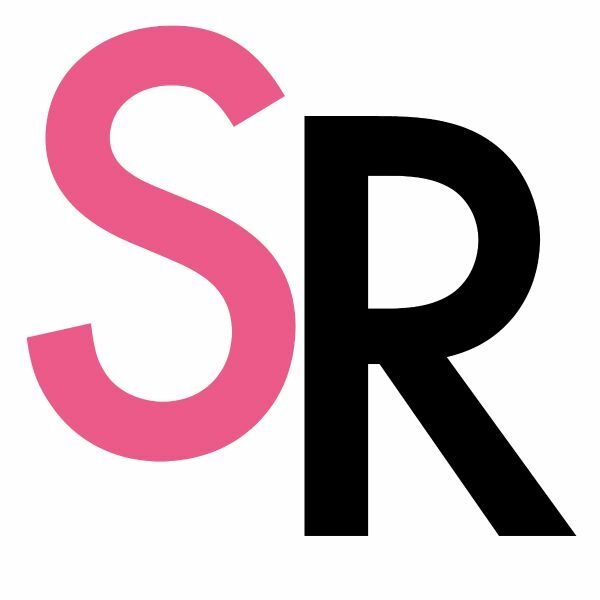 I’d recommend you join the Facebook group I linked to above and read about how people are using theirs, what they make and how easy it really is. The group is very active and there are so many great ideas and helpful tips. Happy Instant Potting! Chop the potatoes into 1″ chunks. Place the potatoes in the IP and cover with water. Drain the potatoes using a colander and then place in a medium-sized bowl. Chop up the eggs and mash into the potatoes. 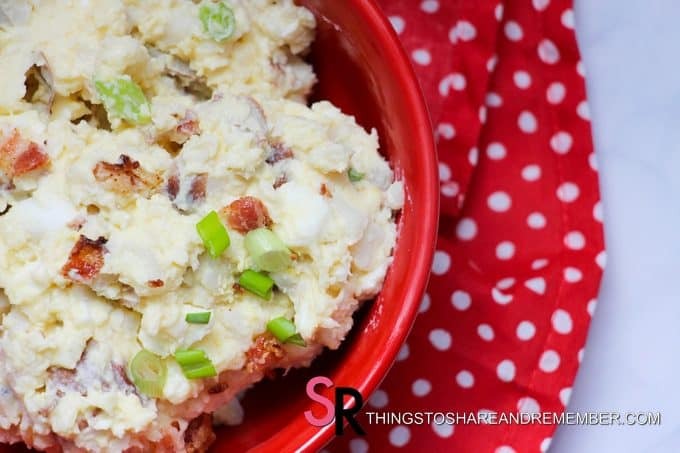 Chop the celery and onion and add into the potatoes-egg mixture, then the remaining ingredients and mash together using a fork or an electric mixer until you achieve the texture that you prefer. Select manual setting and reduce time to 2 minutes. Quick release. Run cold water over eggs until cool. Place the eggs in the fridge until ready to use.